Alnwick Abbey was founded in 1147 by Eustace FitzJohn. The abbey once held two major relics: the chalice of Thomas of Canterbury and the toe of Simon de Montfort. 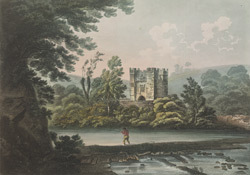 By the 18th century, as can be seen from the print, the only standing building was the square-turreted and crenellated gatehouse, which dated from the 15th century.